About two weeks ago I took our van into the shop to have the driver’s door replaced, the wind had taken it twice in the past few months, breaking the hinges. Every time I drove the van and opened the door I was honestly afraid it would fall off, and with all our trips back and forth to Quebec, having the door fall off would not be a good thing. So into the shop it went for three days. A few days after I picked up the van, I noticed that the sliding door on the driver’s side was starting to act a bit funky, sometimes it would open, sometimes not. We didn’t have time to take it back to the shop, because we were off on one of our whirlwind trips to Quebec and back. On the drive to Lennoxville, we had the teenage boy and our beagle Cocoa sitting in the middle of the van. At this time the teenage boy also noticed that the door was being funky; there were a few times that he was able to open the door, then no matter how much he pulled, it would not slide open. I was pretty sure he was going to break it, so as inconvenient as it was for him, I yelled requested he use the passenger side sliding door. On the way back from Quebec, the door continued to be a problem for us, so as soon as we arrived home, I phoned the autobody shop and explained the funky door (yes, I did say funky, a word I’m sure mechanics just love! I took the van in and went home to await the verdict on the door, believing it was most likely the electronics that were the issue since they had been transferred from the old driver’s door to the new one. Well wasn’t I in for a surprise when the autobody shop phoned me! Apparently someone had turned on the childproof lock on the sliding door stopping it from opening. Now my youngest is 19 years old, so I have no reason whatsoever to use the childproof lock. I went and picked up the van feeling exceptionally embarrassed, thankfully the mechanic was very understanding, stating that I was not the first person to make this mistake and would not be the last. 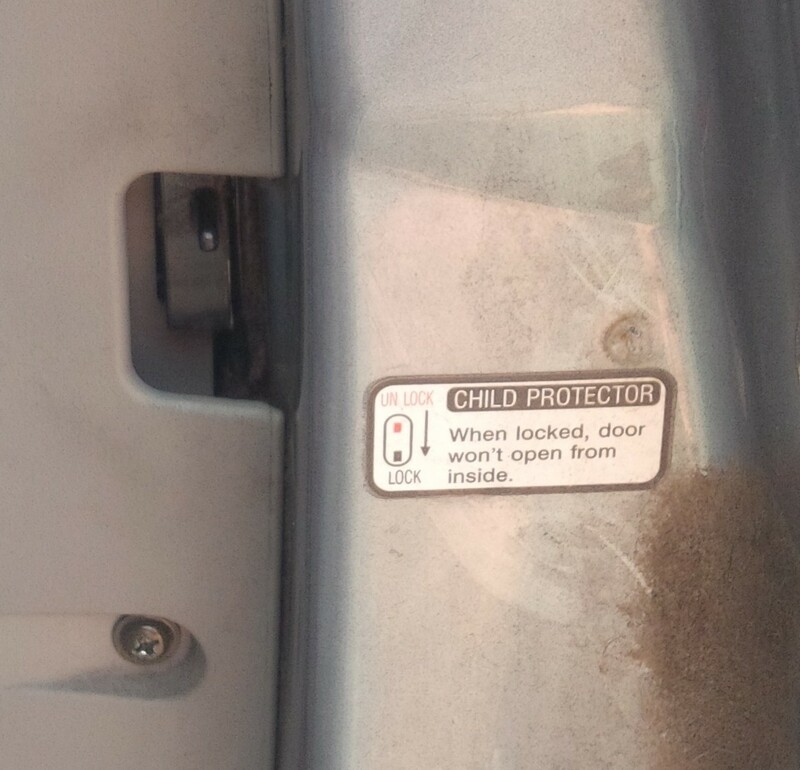 This entry was posted in Autobody, Autobody shop, Childproof lock, Childproof locks, Driver's side door, Lennoxville and tagged Mechanic, Mechanic, Quebec, Quebec, Sliding Door, teenage boy, Travel, travel, Van, Van on May 10, 2014 by AlwaysARedhead.